Final Score: 2-1 aet (Full-time 0-0). Scorers: West Ham Utd; Devonshire (94), Lampard (118). Everton; Latchford (118). 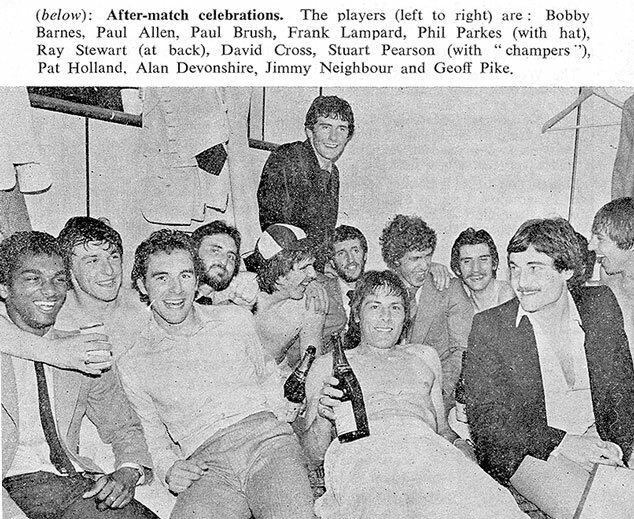 West Ham United: Parkes, Stewart, Brush, Bonds (c), Lampard, Devonshire, Allen, Pearson, Cross, Brooking, Pike. Everton: Hodge, Gidman, Bailey, Wright, Lyons (c), Ratcliffe, Eastoe, Megson, King (Varaldi 95), Hartford, Latchford. The distance from London to Leeds is about three times that from Liverpool to the venue of last Wednesday's replay. 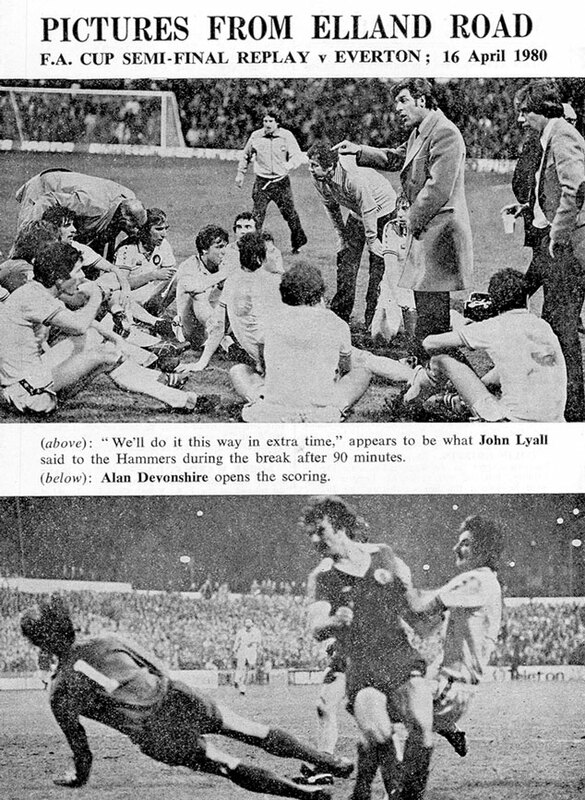 Therefore it was understandable that the Everton fans at Elland Road outnumbered the Hammers' followers by about three to one. However, those who made the journey from the south gave our team tremendous encouragement, and we sincerely thank the supporters who did so much to again encorage our XI on a vital occasion. The match itself was another tremendous tussle between a couple of evenly-matched sides, and it was fitting that it should not only go to extra time but also that it was eventually decided at a moment when a replay at Coventry looked very much on the cards. Eventually one club had to be the loser. That it was the Hammers who finally made a vital step to Wembley was no disgrace to Everton. They fought well, but eventually succumbed to a team which showed tremendous spirit. Frank Lampard dives to head the winner! It was goalless after 90 minutes. Alan Devonshire puts the Hammers ahead after a brilliant solo dribble. 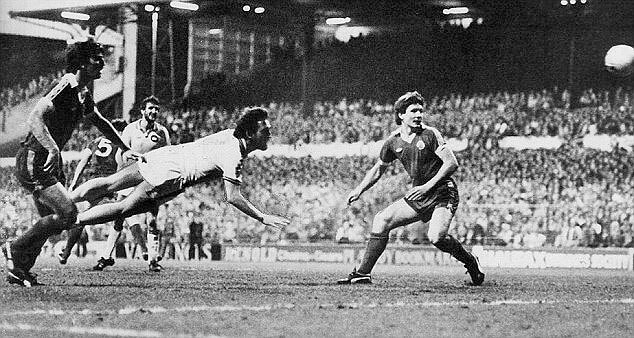 Bob Latchford levels the scores after 113 minutes, scoring with a glancing header and leaping on to the fencing to celebrate with the Everton fans. With just two minutes to go, Brooking swings over a cross, David Cross nods on and there in the box is left back Frank Lampard, diving full length to score the unlikeliest of winners. His celebration goes into West Ham folklore as the left back runs dementedly round the corner flag. Wasn't allowed to go to this game, mid-week, school day etc. Ended up listening to the commentary on a small red transistor radio in my bedroom. The rest of the house was asleep by the time Lampard scored, I couldn't contain myself and run out of my room and up and down the hallway... " what on earth is going on?" came the cry... "West Ham are going to Wembley" I replied.